They play in a Navy town, so the San Diego Padres figured it was time to break out a Navy digital camouflage jersey for Sunday home games. 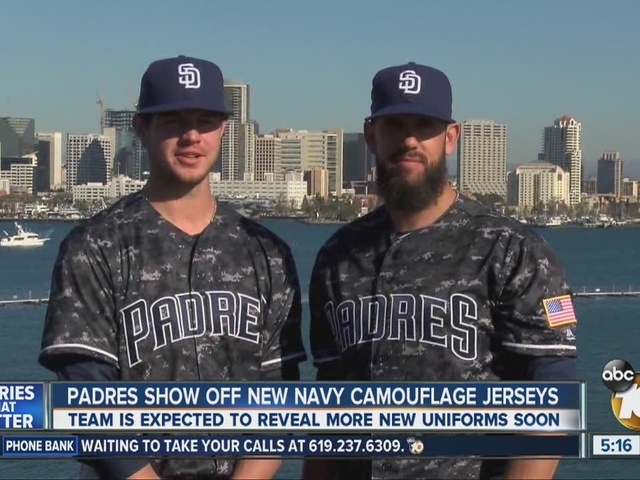 The Padres unveiled the new jerseys Tuesday on the flight deck of the aircraft carrier USS Theodore Roosevelt at Naval Air Station North Island, across San Diego Bay from Petco Park. Team President Mike Dee said the Padres received permission from the Pentagon to use its blue camo digital pattern. The Padres' jersey is modeled after the Navy Working Uniform Type 1, which sailors call their "blueberries." New manager Andy Green, right-hander James Shields and first baseman-outfielder Wil Myers modeled the new jerseys for dignitaries and about 50 sailors. The Padres have worn various camo jerseys for Sunday home games since 2000, honoring the Army, Navy SEALs and Marines. "This is obviously a military community and we've done so much to honor those other branches in the armed services," Dee said. "Stylistically, we saw the Navy digital camo and we said, 'Wow, Navy blue, that's our color, it looks great, why haven't we ever done that?' Collectively we started pushing the idea down the appropriate channels with Major League Baseball." "Ultimately it took the approval of the Navy. This doesn't happen without the Navy," Dee said. "I think they look great," Myers said. "This is one of my favorite uniforms I've ever seen. I think the colors look great." The Padres will wear their Marine digital camo jerseys twice in 2016, on U.S. Marine Corps Appreciation Day and on U.S. Army Appreciation Day. When replicas of the new Navy camouflage jerseys are available in the team store, a portion of each sale will go to the U.S. Navy. The USS Theodore Roosevelt -- known as "The Big Stick" -- has been homeported at North Island just eight days. The Padres have good connections to get a news conference on a flat top. Capt. Craig Clapperton once served under J.J. Quinn, the Padres' military affairs director, who is a retired rear admiral and former commanding officer of the USS Abraham Lincoln. Later Tuesday, the Padres unveiled two new home jerseys: white to commemorate the 2016 All-Star Game in San Diego and a brown and yellow jersey, which will be worn on Fridays. It will be the first time in MLB history that a host team will wear a commemorative jersey for its All-Star season. That jersey will feature navy and yellow accents. Brown and yellow was a classic Padres color combination from 1969-1984. The new jersey is an updated version of the brown that was worn as the predominant color in the team's road jersey from 1976 until 1984. The Padres' current blue alternate home jersey, added in 2012, will move to a road-only alternate.